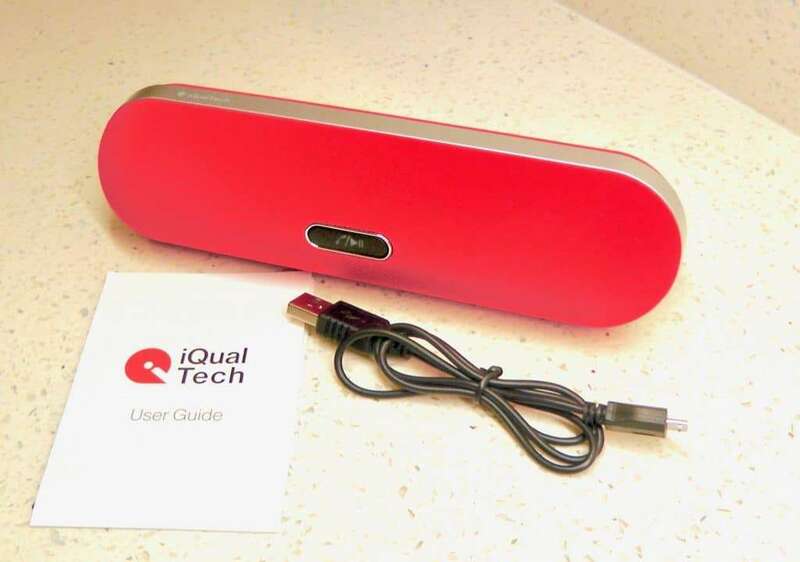 I was very excited to be sent a pair of the stylish looking iQual Tech Bluetooth Speakers from a company called iQuadTech for review. They have also sent me a discount code which only our lucky readers can have – you need to read on for that bit! There are many reasons to like these speakers. They were, first of all, packaged very well. You can clearly see what you are getting through the clear side of the box and the tough card not only provided protection during transit but also creates the impression of a quality product inside. The box includes the Bluetooth Speaker, a small instruction manual and a USB Power Cable. There’s no power adapter which in my view is a good thing as you can charge these from an USB Power Adapter. As shown in the picture below I just found a couple of spare iPhone / iPad chargers but really could have plugged these into any powered USB socket. These speakers are light in weight which is great and this makes them very portable so they are easily moved around your house wherever you move. This is perfect way of making household chores a bit more bearable if you have some music to listen to as you go. They also look great in your house and certainly catch the attention of visitors. This is because they look more expensive than they are due to the good build quality and their sleek appearance. There isn’t the hassle and unsightly cables and the 9 hours of continuos wireless play is fantastic. They connected with my iphone without a problem and I was up and running in seconds. No app is needed, they just use the built in Bluetooth audio functionality and there is a 10 metre Bluetooth range so you don’t necessarily need to be right near the speakers. I was given the 2 speaker pack which means you can enjoy a bigger stereo sound using iQual Tech’s XP+ pairing technology. This technology allows you to wirelessly create separate left and right channels to get that stereo experience. This portability would make these speakers perfect to take on holiday. I am already picturing myself at a country cottage retreat with the children dancing around to their favourite songs – great for rainy days if you are holidaying in the UK. 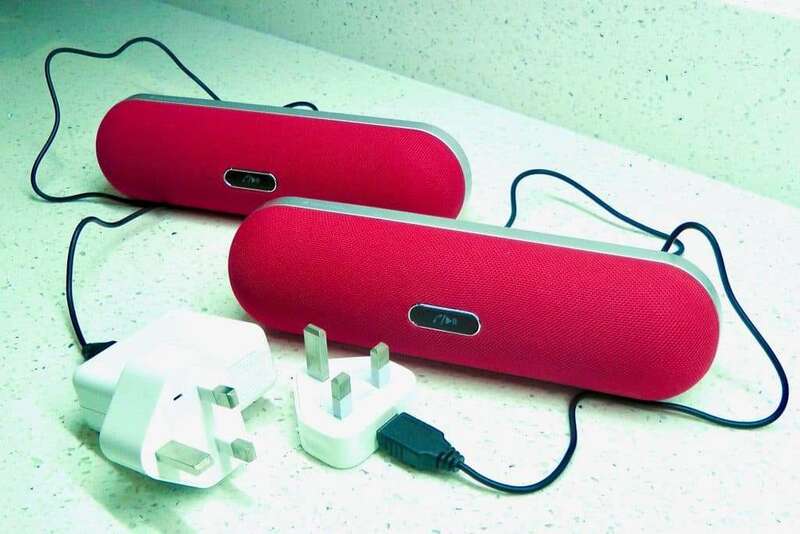 If you are use to frequent business trips away these speakers are perfect for that too as they are so light. They also have a built in microphone so if you are away on business they can be used as a conference phone when paired with your iPhone. That’s much nicer than having everyone try and crowd around your iPhone. Review view showing the power socket, auxiliary 3.5″ audio jack and power switch. The speakers themselves have luxurious feel about them and have a very neat design. 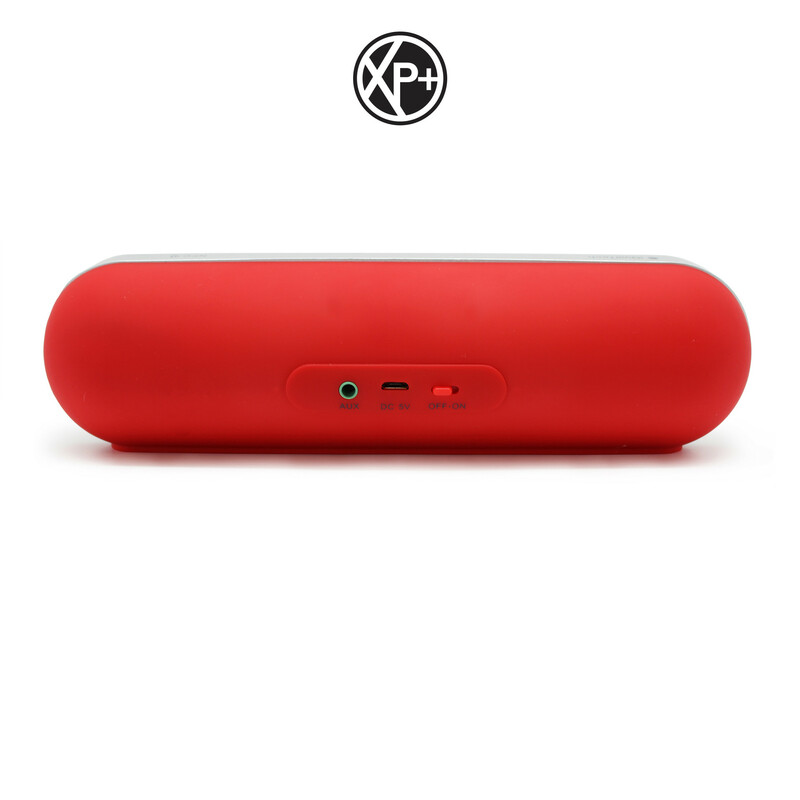 As you can see from the photo below, I have the eye catching red speakers which are a pill shape, finished with a silver strip around them. They also have red thicker strip at the bottom so they shouldn’t slip off unless helped by an over enthusiastic three year old. Now for the all important sound test. They fair very well in their £55 price bracket for the 2 speaker pack, the sound is good and doesn’t seem to distort as the volume gets louder which is a real bonus. 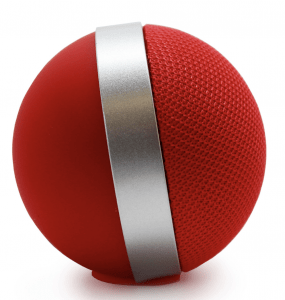 For this very reasonable investment of £55 you are getting wireless stereo sound within seconds of switching them on wherever you are with no messy cables via a stylish and lightweight speakers. If you want a cheaper option you can opt for the £29.50 single speaker which gives brilliant sound for one little speaker. When used as a stereo pair I was impressed by the clear left and right separation, when listening to a play on the radio you could really picture people moving around the stereo sound stage. I’ve seen far more expensive stereo equipment not produce such a good result. All in all I would recommend these speakers within their price bracket for their super cool looks, quality feel, portability and ease of their xp+ Bluetooth pairing which was very quick and easy with no extra app needed. As I said earlier they look a lot more expensive than they are so would make a really good gift. The speakers reviewed above are now being sold for £29.50 each or £55.00 for a pair on the iQual website. The excellent news is that you can save an extra 10% with iQuadTech via their website using discount code GET10OFF at checkout. Now I just need to book that holiday!